Hands-on Science FUN for young and old! We’ve got food technology, body painting, wildlife conservation, aerial drones, gaming and computers, the UTAS Motorsports team plus a full PROGRAM OF SHORT TALKS. Come and find out how science is key to a successful future. Join experts in their fields from the University of Tasmania as they share their knowledge with demonstrations, talks and Q&A. 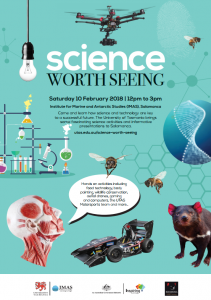 This is a free event and everyone is welcome to come and find out about some of the amazing science happening in Tasmania right now!